The A/R Aging report provides a list of all of the open (unpaid) customer invoices and the number of days they have been outstanding. In order for this report to be useful, you must set invoice terms for all of your customers. If you have not set up invoice terms in the customer profile, then QuickBooks will not be able to provide you with a reminder when your customer’s invoices are coming due. In addition, the A/R Aging report will not be able to track the number of days the invoices have been outstanding. There are a couple of ways to set up invoice terms. The simplest option is to set up default invoice terms for all customers. This option works best if the majority of your customers have the same invoice terms (i.e. Net 30). In the How to Set Up Invoices, Sales Receipts & Estimates lesson, we walk you through step by step how to set this up. If you offer different terms to many of your customers, then refer to our How to Set Up Customers lesson. Why is the Accounts Receivable Aging Report Important? The A/R Aging Report can help you to stay on top of customer invoices that are past due so you can follow up with your customers about payment. The longer an invoice remains past due, the higher the likelihood that you may not get paid without some type of follow up with your customers. Not getting paid can impact your business’ cash flow, so it’s important to keep on top of your unpaid invoices using an A/R Aging Report. To help demonstrate the components of the A/R Aging report, we will take a look at the A/R Aging report for our fictitious company, Paul’s Plumbing. 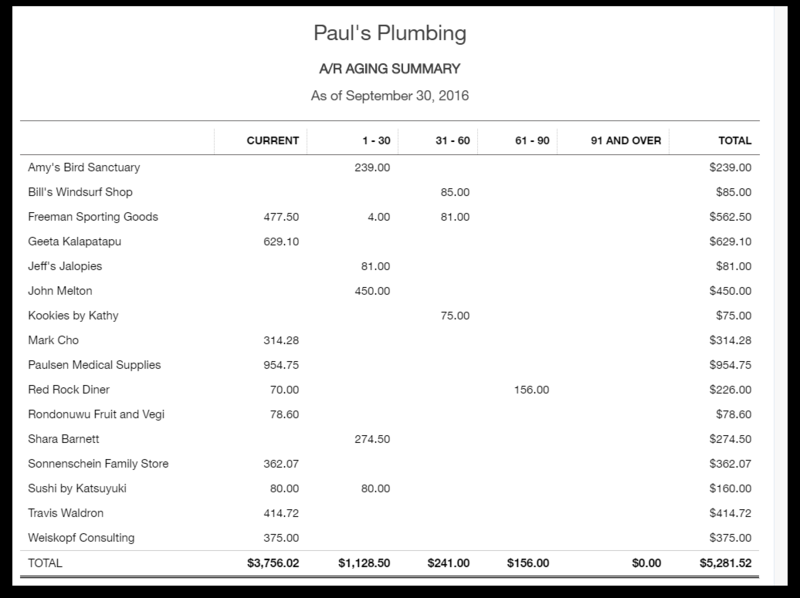 Below you will find the A/R Aging summary report as of September 30, 2016 for Paul’s Plumbing, along with a brief explanation of the different components. Date: Similar to the Balance Sheet report, this report is as of a specific date. In this example, it is as of September 30, 2016. Aging categories: This report is organized by customer and then by 5 different aging buckets (e.g. 1-30 days late, 31-60 days late, etc.). Current column – Indicates invoices that are not yet due. No action is required for invoices that appear in this column. 1-30 column: Indicates invoices that are 1-30 days past due. Certainly you don’t want to contact a customer who is just a couple days past due. However, for any invoices that are 7 days past due, I would recommend that you send the customer a friendly reminder either by telephone or email. If you send an email, I would include a copy of the invoice as well. 31-60 column: Indicates invoices that are 31-60 days past due. By this point, you should have sent at least 1 or more reminders to your customer to pay their outstanding balance. If you still have not received a response, then I suggest that you send them a letter on letterhead that includes verbiage like “in order to avoid any additional late fees or penalties, please remit payment immediately”. 61-90 column: Indicates invoices that are 61-90 days overdue. Unless you have spoken with your customer and provided them with additional time to pay their outstanding balance, more than likely you will not be getting paid. At this point, you may want to look into sending this to a collection agency or possibly writing it off as bad debt. 91 and Over: Indicates invoices that are 91 days past due. Similar to what I mentioned for anything in the 61-90 days column, you should likely be sending this to a collection agency or writing it off as bad debt expense. Totals by group: a good rule of thumb is to make sure that the majority of your outstanding receivables is within the first 3 columns. It should be a rare occasion that you have something creep into the 61 and over categories. If you do, be sure to address it quickly. How Do I Run an Accounts Receivable Aging Report in QuickBooks Online? Click on the Recommended Reports tab. The A/R Aging Summary report is right below the Company Snapshot as shown below. From this screen, you have several options to choose from as indicated below. Show non-zero or active only – Display only active customers that have an outstanding balance. Days per aging period – Select the # of days you would like for each aging category. In Paul’s report, we have each category set to 30 days (i.e. 1-30, 31-60 etc;) Typically this is the most common option but if you have terms shorter than that (i.e. Net 15 days) then you may want to go with 15 day increments (i.e. 1-15 days late, 16-30, etc.). 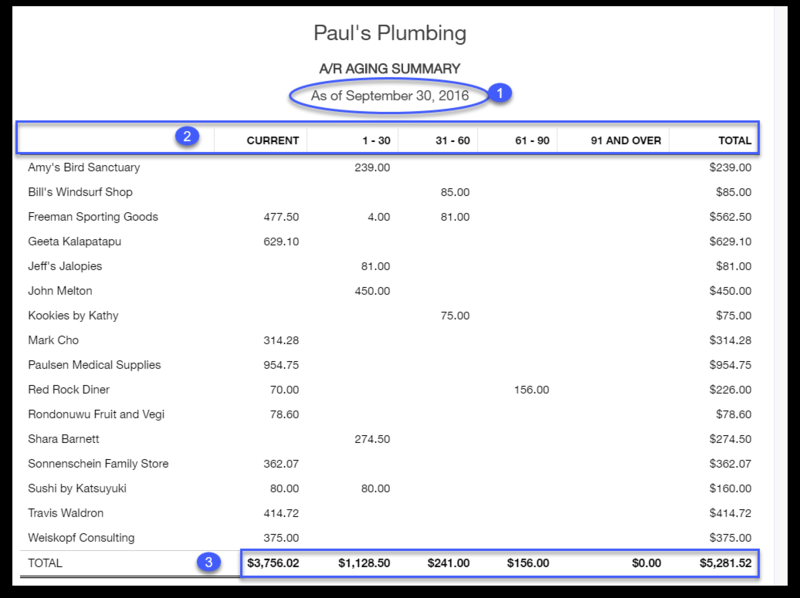 Click the Finish button, and your A/R Aging Summary Report will display on screen like the accounts receivable aging report example for Paul’s Plumbing below. In order to get to the invoice details for the summary report, you simply click on the customer that you want to see the invoice details for. When you do so, QuickBooks will provide you with details of the invoice(s) that make up the outstanding balance for that customer, as indicated below. Be sure you create an invoice for all credit sales as they occur. Make sure that you set up payment terms for all customers. Establish a follow-up plan for invoices that become past due. For example, what action will you take when they are in each of the buckets (1-30, 31-60, etc.)? Review the A/R Aging Report on a weekly basis if possible. For more tips, check out our articles on Setting the Best Invoice Terms for Your Customers and Getting Paid Faster. 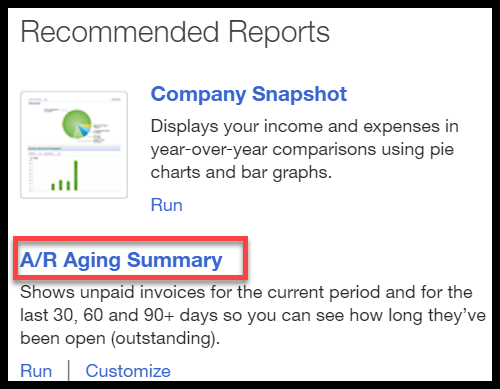 That wraps up the section on How to Run an A/R Aging Report in QuickBooks Online. The next lesson in our QuickBooks Online Training Course will be How to Run an Accounts Payable Aging report in QuickBooks Online. In this course, we will discuss what the Accounts Payable Aging report will tell you about your business and how to create an A/P Aging report in QuickBooks Online.